Enjoy your stay in our wonderful Beachtown Vacation Rentals. Dewey Cannon Trading Gift Shop: Unique gifts for all. Two to six hour beginner and intermediate canoe kayak trips on Dowagiac River. Outpost provides you with everything for the beach. Choose hot beach clothing, beach toys, chairs and umbrellas. Kayak rentals etc. Since 2005, our mission at Third Coast Surf Shop has been to spread the joy of the surfing lifestyle in the Great Lakes. Brookwood Golf Course provides a challenging and well-maintained golf course. Golfing and event venue nestled near the beautiful Indiana dunes, just minutes from Lake Michigan. Whittaker Woods Golf Course is a Ken Killian designed challenging 18 hole par 72 golf course. New Buffalo’s only dog park where dogs can run and play. Located on the south end of Harbert Community Park, just North of the Township Offices, the Dog Park can be accessed from the south end of the Harbert Community Park parking area. Red Arrow Highway, Sawyer Dogs are allowed in the park, on the trails, and on the beach outside the buoys that mark the swimming area but not on the swimming beach. Our Tip: Kids love to climb the 260-foot dune, then run and tumble down the hill like mad. Spectacular views from the top of the dune! Harbor Country’s newest park (opened in 2014). It features a 300-ft canopy walkway leading to a river viewing and fishing platform on the Galien River. Our Tip: Take some time to enjoy the views from the canopy walk, then explore some of the less traveled trails and interact with nature. An easy walk for just about everyone. The Lions Pavilion is named such because it was a generous gift to the City of New Buffalo from the New Buffalo Lions Club. The pavilion is located at 101 Marquette Drive, which is across the street from the City Beach. Located at the end of Whittaker St., just across the bridge. Lifeguards are on duty Memorial Day through Labor Day from 10 am – 6 pm. Red Arrow Hwy., just north of US 12, has a pavilion with picnic benches, grills, children’s playground, basketball court, splash pad, bocce ball courts, horse shoe pits and restrooms. Warren Woods Rd just south and east of where Warren Woods Rd crosses I-94, is 263 acres which include wetlands, woodlands, a 5-acre lake and borders the Galien River. 13411 Red Arrow Hwy., just north of Harbert Rd., includes a regulation size Little League baseball field, bleachers, a pavilion with two grills and picnic tables, benches, a playground, a small fishing pond and the area’s newest dog park as well as an ice skating rink in the winter. E Maple St, Three Oaks, is home to the historic Dewey Cannon which was presented to the village by President McKinley for raising the highest per capita amount in the nation for the Spanish-American War Memorial. Bandshell, picnic tables, and volleyball courts are available. East of I-94 between Warren Woods Road and W. Elm Valley Road. Warren Woods State Park, administered by the Warren Dunes State Park officials, is a favorite site for hikers and naturalists. Warren Woods is a virgin beech-maple forest, the last of its type known in Michigan. Our Tip: If you are looking for a stunningly beautiful walk in the woods, this is the place. Be sure to hike to the bridge. Located next to the Public Beach off Marquette Drive on the Galien River. Located on Red Arrow Hwy, just north of Kruger Road at the bridge in New Buffalo Township. This state-run access area can also be used to launch small fishing boats, kayaks, and canoes. Our Tip: Show up early in the day and rent a kayak for a leisurely ride through the winding Galien river. Enjoy sport fishing at its best aboard the 38′ ft. custom boat. Sunset cruises & charters. Catch your trophy fish. Scooter Rentals – Buzz along lakeside roads, find remote beaches or roam the local streets to discover all the area has to offer. New Buffalo Sailing Excursions offers a great way to see the beautiful shore of Southwest Michigan with daily sails in season. Children’s hourly child care for ages 6 weeks through 12 years. A family friendly arcade. Open daily. Located at Four Winds Resort & Casino. A 5-acre family fun park for kids of all ages. Offering go-karts, batting cages, bumper cars and boats, miniature golf. Our Tip: If you are looking for a day of adventure with the kids, this is a must. The Washington Park Zoo founded in 1928, encompasses 15 acres on a hilly sand dune and located near the southern shore of Lake Michigan. At Dablon Vineyards, our team shares a passion for creating quality, small batch wines. Fruitful Vine Tours. Our goal is to provide fun and informative wine tours. Experience wine country with an awesome tour. We are a tour bus business specializing in customized tours of southwest Michigan’s best wineries, breweries, and distilleries. We do our tastings a little different. Our wines are served by the flight and each wine is paired with either gourmet chocolate or cheese. Our Tip: Plan on longer waits in the summer, but the quality of the food and beverages is worth the wait, plus Sawyer is just such a cute little town. Journeyman Distillery is a craft distillery focused on organic whiskey and spirits. Distillery and tasting room. Our Tip: They give tours here as well, so be sure to call in advance and find out specific times. Neighbor of Harbor Country. Gifted winemakers have clustered 21 wineries and tasting rooms within a short drive of each other. Each offers a different experience whether you seek a romantic getaway, expert advice on selecting the right wine, dinner overlooking the vineyards, or a grape-stomping good time. Shady Creek Winery offers award winning wines including West Coast dry reds and Midwest varietals. Staymaker is a full-service restaurant attached to Journeyman Distillery, specializing in scratch cooking and locally sourced foods. Our Tip: Share appetizers and entries allowing you to try a little of everything. They use their own spirits in everything from the pizza crust to the homemade ketchup. Pretty hip hang out for our neck of the woods. A charming treasure trove packed to the rafters with fine wines and related gift ware. Specializing in artisan wines. Fernwood comprises 105 acres along the St. Joseph River between Niles and Buchanan. Antiques and home furnishings including mid-century to traditional, light fixtures, pottery, books, jewelry. Two large buildings with thirty-four great dealers, highest quality in the area. Discover local color in Dunescapes, paintings, photography, fine crafts, glass, jewelry, furniture, clay, classes and custom framing. Sojourn features Vintage -Mid-Century – Modern home furnishings and accessories. A 5-acre family fun park for kids of all ages. Offering go-karts, batting cages, bumper cars and boats & more. Situated on a beautiful landscape in New Buffalo, Four Winds New Buffalo offers gaming, restaurants, live theater & more. Jewelry– sophisticated yet simple hand worked pieces crafted from the finest materials create timeless appeal. Adelaide is an upscale woman’s clothing store specializing in European Designer Fashion. Customs Imports carries items from all cultures and corners of the world. Jewelry, furniture, home décor. 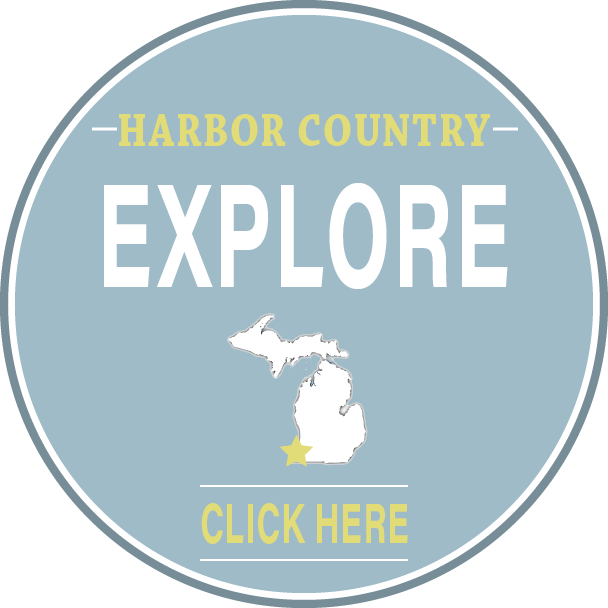 Come visit to enjoy the fruits and foliage of the Harbor Country Fall favorite. A national Historic site. Founded shortly after the Civil War originally called the Union Meat Market. Everything for the home: custom furnishings, flooring, beams, outdoor structures, railings. Save 25-65% every day at more than 120 outlet stores. Sawyer Home and Garden Center has everything from garden supplies & plants, decorative accessories, unique wines and gourmet foods. Our Tip: A must see, so much more than a garden center. Truly a unique place. For more than 40 years, Fredman Design Group has been in the business of Interior Design in Chicago and Harbor Country. A landmark destination boutique, celebrating over 24 years of exceptional clothing and personalized service. Chef Jenny Dillon’s sophisticated spin on pub fare, responsibly sourced and beautifully presented. Our Tip: After dinner, walk through the hotel and take the elevator to the rooftop terrace for a stunning view of the marina. Our Tip: Ask for their daily selection of vegan or gluten free options. Brewster’s Italian Cafe recreates a quaint Italian street cafe – creating high quality dishes from many regions of Italy. A taste of the Mid-East, fine Kurdish cuisine, Turkish Lebanese wines, an atmosphere that feels like home. David’s is a family-friendly delicatessen and coffee shop. Creative specialty sandwiches every day. Specialty food shop with deli-bakery and catering services. All foods are created in our on-site kitchen. Homemade everything. Our Tip: Grab an ice coffee made of frozen coffee cubes. Local microbrewery brewing strange, crazy consistent beers. Started by two local Harbor Country guys, serving great food too. Swedish pancakes, quiche, omelets, frittatas, soups, salads, and weekly specials made with local produce. Farm to table, globally inspired locally sourced fare. Michigan craft beer list, extensive wine list. New Buffalo Bills is a wood-fired pit BBQ restaurant offering drive-thru, carry-out, and dine in services. Skips Restaurant and Catering is Harbor Country’s only award-winning steakhouse. Song Asian Cuisine offers the most comprehensive menu of Asian food in Harbor Country! Chef Lei Song. Staymaker is a full-service restaurant attached to Journeyman Distillery, specializing in scratch cooking. Hip, great place to dine and unwind. Our Tip:Head straight to the roof top terrace where there is occasionally live music in the summer. Artisan comfort cuisine from Italy featuring traditional rustic Italian dishes. Beautifully renovated upscale restaurant & bar area on the marina. Our Tip: Show up early in the summer and grab an outdoor table with views of the marina. Harbor Country’s best pizza! We use only the finest ingredients available; no substitutes!